It’s easy to brighten up your bathroom with glass block from Pittsburgh Corning. Pittsburgh Corning Corporation, a leader in the glass block industry for over 75 years, is providing a spring home improvement guide showcasing their ProVantage® Standard Fit Shower Kit for Do-It-Yourself (DIY) homeowners. This guide is part of an emerging Project of the Month series and focuses on how to build a glass block shower in your bathroom. The ProVantage® Standard Fit Shower Kit is designed exclusively for use with Pittsburgh Corning glass block. The installation kit makes it easier and more cost-effective than ever to bring bright, beautiful glass block into bathroom designs. With spring cleaning around the corner, this project is a great way to replace a standard bathroom tub with a glass block shower. 1. 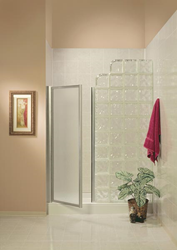 Determine which Pittsburgh Corning glass block pattern will best fit your bathroom. 2. Review the materials list from the ProVantage ® Standard Fit Shower Kit. The whole system can be purchased in a complete kit. 3. Use Pittsburgh Corning’s Project Planner to familiarize yourself with how to install your project. This will provide you with glass block options, installation methods, and limitations for each type. Pittsburgh Corning provides many ideas for DIY homeowners to add glass block to their homes. The installation kits and guides are meant to make home improvement stress-free and easier than ever.